Independent bottler Douglas Laing & Co. is marking the 10-year anniversary of its Big Peat blended Islay malt expression with a commemorative bottling. Big Peat 10 Year Old celebrates the whisky’s launch in 2009 as the first expression in Douglas Laing’s Remarkable Regional Malts collection, which reflects the flavour characteristics of Scotland’s whisky regions. Bottled at 46% abv without chill filtration or colouring, the expression features a blend of Islay single malt whiskies. 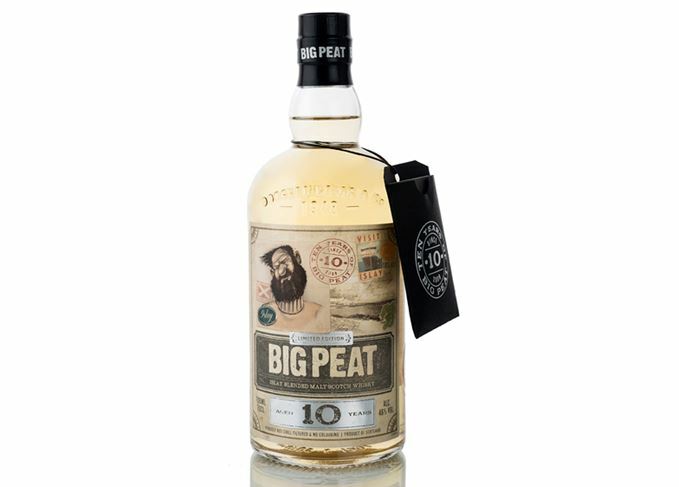 Big Peat 10 Year Old is described as having ‘peat smoke and damp earth’ on the nose, with flavours of ‘BBQ ash’ on the palate and a finish that is ‘long with streaky bacon, tobacco and toasted marshmallows’. Douglas Laing chairman Fred Laing stated: ‘Back in 2009, I dreamt up a feisty Ileach fisherman who would later become Big Peat, and subsequently be joined by Scallywag, Timorous Beastie, Rock Oyster, The Epicurean and The Gauldrons to deliver what we so modestly designate our “Remarkable Regional Malts”. Each bottle label features illustrations, emblems and stamps honouring ‘Big Peat’s Islay home’ and is accompanied by a foiled storybook detailing the ‘legend of Big Peat and his whisky adventures’. Big Peat 10 Year Old will be priced at around £65 and a approximately 11,000 bottles will be available from specialist retailers in the UK, Europe and Asia. The indie bottler’s latest anniversary whisky contains malts from every region in Scotland. Douglas Laing is to release its first Feis Ile edition of the Islay blended malt in May. New whiskies include Douglas Laing’s Big Peat 2017 Fèis Ìle bottling and a trio of Strathmill malts. Islay whiskies to mark the start of Fèis Ìle, with peat to the fore – but not altogether dominating. The blended Islay malt is releasing its first age-stated expressions, starting with a 25-year-old.